Have you met some of our better halves? WRC was pretty much everywhere last weekend, racking up some nice race results, with another 25 or so attending the Sunday Distance Run. Read along for some of the best of the bunch! 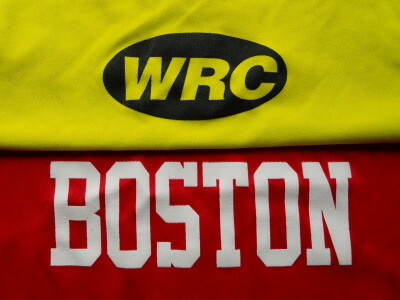 WRC sends its love to Boston. (L-R) Front: Ben Stutts, Michaela Corr, Carla Freyvogel, Nelson Paz, Ayalew Taye. Middle: Dan Yi, John Kendra, Lucy Rogers, Hillary Tipton, Josh Sohn, Emily Buzzell, Max Lockwood, David Pittman. Back: Jesse Frantz, Drew Killian, Kit Wells, Jerold Paulson, and Gerry Ives. Not pictured, but also present: Tris Kruger and John O’Donnell. Many thanks to Grace Eginton for snapping this photo. 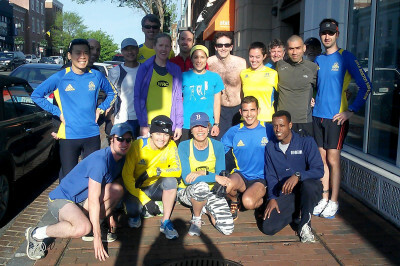 After a five year hiatus, the Washington Running Club is finally back to contending for the Men’s Open and Women’s Open team titles at the 2013 Boston Marathon. We’re liveblogging on race day with news, statistics, and color commentary. The B.A.A. Weather Coordinator appears to have done well this year with getting the temperature under control. We are looking at a high in the upper 50’s. WRC is fielding teams in the both the women’s and men’s team competitions. The WRC Women’s Team is comprised of Emily Buzzell, Rachel Clattenburg, and Raquel Morgan. The WRC Men’s Team is comprised of Drew Killian, Brian Savitch, and Mark Wright. Other Sunday Distance Run regulars running in Boston include Alan Pemberton and Max Lockwood. As best we can tell, the club last fielded scoring teams at the Boston Marathon back in 2007 (summary). Historically, the club has finished as high as 2nd in the Men’s team competition back in 1977 (article), and won the Women’s team competition in 1983 (newsletter); all of which is notably before the obtainable records of past team champions. The WRC singlet is packed. More to follow from Boston. Good luck to everyone!